Rainy days can make for a miserable day for us humans, however the mosquitoes love it. The rain along with the warm summer days shortens the time needed for their eggs to become adults. 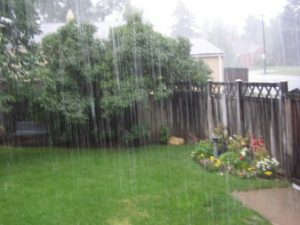 Have you noticed standing water in your yard? If so you will need more then adult control products. Mosquito larvae requires additional professional products for complete mosquito control. Our mosquito barrier sprays are not any less effective on rainy days as we add a adjuvant to our spray mixture. This adjuvant allows the mist spray to spread out and bond securely to what is treated without rain washing it away or making it any less effective. We do not mist spray on days that it is raining unless we have 15 minutes of drying time after we treat.